Give Sisters Personalized T-Shirts to the one person who knows you better any anyone, you sister. 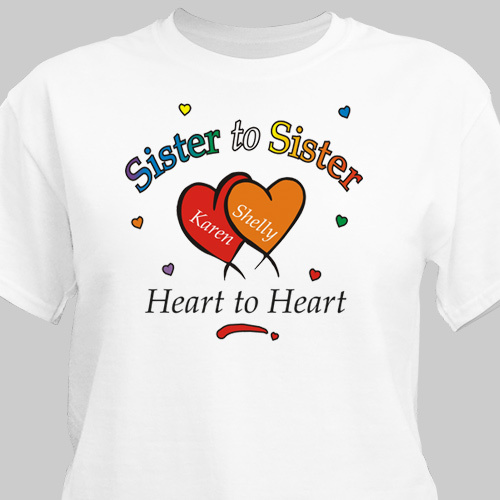 Each Personalized Heart to Heart Sisters T-shirt is a wonderful way to display the love you have for each other. Our Personalized Sisters T-Shirt is available on our premium white 100% cotton Personalized Shirt, machine washable in adult sizes S-3XL. Sisters shirts include FREE personalization! 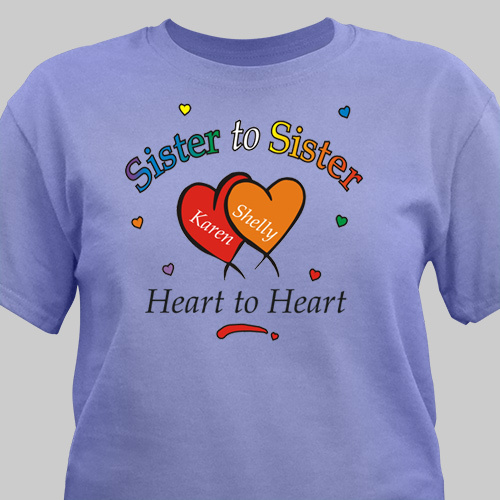 Personalize your Sisters gift t-shirts with up to 6 Sisters names. Each sisters name will be personalized on their own heart. Additional Details Personalized sisters shirts for all your sisters make Unique Sister Gift Ideas. Gift ideas for your sisters on Sister's Day or for a wedding bridal shower gift.